Select this option to have Hexamail Guard automatically integrate with IIS on the same machine. 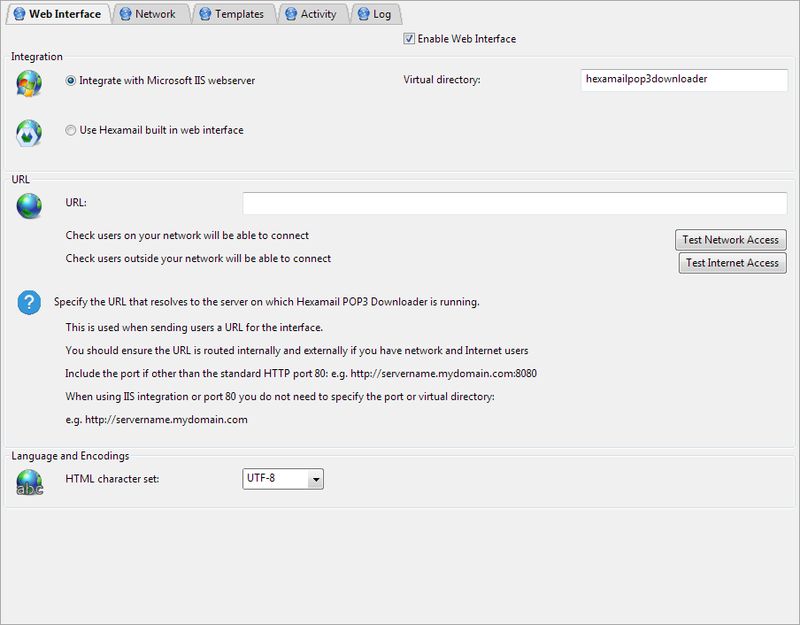 This makes the Hexamail web interface show up as an 'application' or virtual folder within IIS. You can specify the virtual folder name using the Virtual directory setting. User can ALSO access Hexamail using the special webui port specified in the Web Interface/Network page. Hexamail has a powerful and scalable built in web interface. This dedicated web server is optimized for serving the templatized pages used by Hexamail. Select this option if you want users to use the Hexamail web interface directly rather than integrated with another webserver. The URL you wish to send to users for them to access the web interface. The URL sent to users should correspond to the host and port setup for the web interface. If for example you have set the Port to 8080 and the host is left blank (to bind to all NICs), then the URL should be http://hostmachinename:8080 Remember that if external users are to manage their own SPAM then the URL specified must be accessible from outside your local network, and your firewall must be configured to allow incoming TCP (HTTP) connections to this machine on the chosen port. If you leave this setting blank a URL will be automatically constructed from the machine hostname and configured port.